A beloved pet passing away is the heartbreaking part of owning a pet that all pet owners have to face at some point. We form such amazing bonds with our cats that even years after they have passed away we can still have feelings of sadness. We are left with an empty space in our heart. It is an extremely difficult decision to voluntarily end the life of a beloved cat through euthanasia. Sometimes there is a clean cut medical reason but often the edges are blurry and we feel as though we are stumbling about waiting for a sign. Eventually we do make the dreaded decision or the cat passes away naturally however even being prepared for a cat passing away doesn’t lessen the feeling of grief. For people living alone or people without a support system it is a lonely and sad time. There are places online where you can turn to for support. This website is specifically for pet bereavement. There is a chat room ​for those who want to connect with others or share ​their experience. To use the chat room ​it is necessary to register on the site, which entails providing a username, email address and making a password. This is free however there is also a paid membership which has other functions. All of the information is on the site. Often the kids and the cat have grown up together and the cat’s life from kitten-hood to adult has formed a substantial part of the child's life. Even if the kids have left home, everything to do with the cat is embedded in their memories so it is difficult for kids of any age to accept. Don’t assume the big kids are okay, everyone will feel sad. It is important to talk about end of life of the pet and what will happen at that time. It is okay to show your sadness. Grief is part of life and covering it up really sends the wrong message to our kids. Sometimes we do not give our kids enough credit for how they will handle a situation. Depending on the age of the kids, many have already been exposed to death or have seen it on TV so although it may be the first time they have experienced death personally, it may not be an alien concept. Creating a memorial is a lovely way to acknowledge and remember a pet. 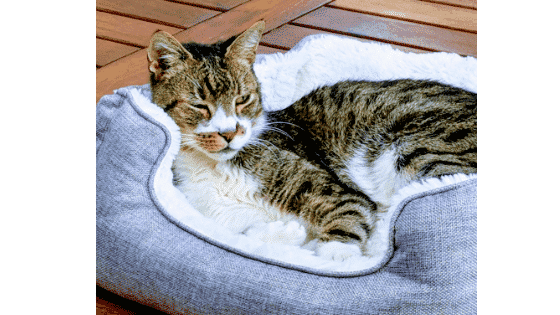 We have recently had a pet death in the family, our beloved cat of almost 18 years and it is painful to write about this some 5 weeks later. We have created a memorial garden for him. It is newly planted and the arrangement may have to change as time goes by and the plants become larger. The terracotta dish used was one that the cat for some reason took a liking to and drank from. The hole at the bottom of the pot, for normal drainage as a garden pot, had been covered so it could be filled with water. ​There is another bowl nearby that filled from ​the reticulation on daily basis so ​it always had fresh water. This was another favourite so I have just popped a maidenhair fern into the pot. ​I don't have a great track record with maidenhair ferns so it's quite likely that this will need replacing at some point. I hope that you can consider planting your own memorial garden that is appropriate and suitable for your circumstances. Planting a tree or shrub would be another idea. A tattoo is not for everyone but is a very popular way to memorialise a pet. Jewellery in the form of a pendant that is specifically designed to hold some of the pet's ashes is a popular keepsake. This is a way to say that the pet is always close to the heart. We have endless photos of the cat but they are all in digital format and are not grouped together in any order, other than look at the kitty, the kitty is so cute, the kitty is asleep etc. It doesn't make for easy viewing when photos are on a computer or phone. I have made ​photo-books in the past from photos taken on holidays and it is nice to sit down and relive the memories by looking at a book. It is tough when a pet passes away. There is no doubt that bundle of fur that has been sitting in the window or on the couch for years and years has wormed his way into your heart. When he is no longer there it leaves an empty space. If you plan to bury your cat at home, check with local council first. Professional pet cremation services are often a preferred option. Your local vet will usually be able to give you information regarding cremation. Often your pet can be collected from the vet by the cremation service and the ashes are then returned to you. Creating a memorial is a way to maintain and feel the cat's presence. This can be a way for everyone in the family to group together to acknowledge the cat's passing. If children are young it can be as simple as saying a few words and the children saying goodbye. If children are a little older they may have written a poem or drawn a picture of the cat. 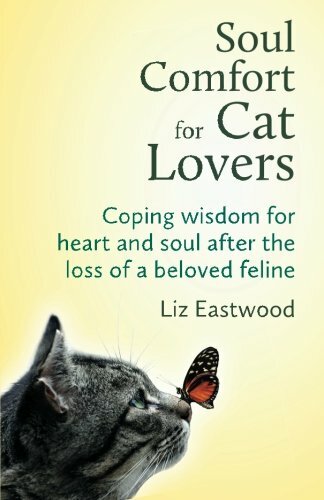 Liz Eastwood has written this book from a personal perspective along with advice from experts and stories from other cat lovers. Dealing with grief is a personal thing, there is no one size fits all. As with any book designed to help us reflect, there will be parts that resonate more deeply than others. Part 1 Coping with the loss of your feline Friend : Wisdom for mind, body and spirit. Part 2 Finding Comfort In Wonder : Allowing the possibility that death is not the end. Part 3 Conclusion: Emerging whole After loss.